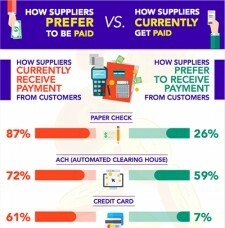 New Infographic Shows the Disconnect Between How Customers Pay and How Suppliers Prefer to Paid | Company Newsroom of Receivable Savvy, Inc.
ATLANTA, April 11, 2018	(Newswire.com) - The most important issue supplier organizations face, whether they be small businesses or Fortune 500 companies, is receiving payment from customers. A key finding of Receivable Savvy's "2017 Perceptions Study" shows that while supplier organizations receive payment via a particular method from customers, many actually prefer to receive that payment via another method. For example, 87 percent of suppliers receive paper checks from customers but only 26 percent prefer this method. In addition, 61 percent of supplier organizations accept credit card payments from customers. While e-commerce and retail organizations constitute a small segment of respondents, virtually all other companies do not prefer credit card payment, as only 7 percent favor this method. 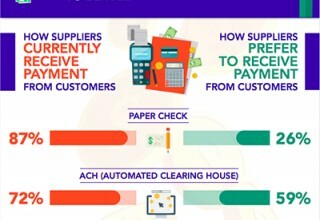 "This new infographic illustrates the disconnect between suppliers and customers when it comes to paper checks, credit cards, ACH and other forms of payment," said Ernie Martin, Founder and Managing Director of Receivable Savvy. "The infographic also includes specific reasons supplier organizations give for preferring one payment method over another." 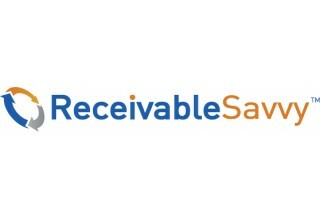 The infographic can be accessed and downloaded here or here and was derived from Receivable Savvy’s "2017 Perceptions Study – Analysis of Invoice-to-Cash Practices and Preferences of Supplier Organizations."